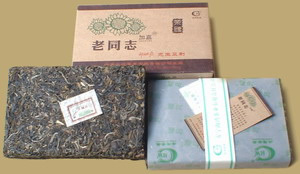 A classic Lao Tong Zhi raw Pu-erh from the Haiwan tea factory, packed in a handsome box. The tea has quite a flowery character with a nice aftertaste. After 2-3 infusions it gets more mellow and sweeter.